Silversea have released the first details of their 2013 programme, including fabulous new explorer voyages on Silver Explorer. The new sailings include visits to over 450 destinations, on all 7 continents — including maiden calls at a host of new ports. 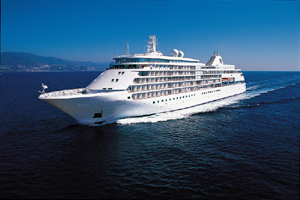 Silversea's 2013 itineraries includes a 115 day world cruise, from Los Angeles to Fort Lauderdale, onboard Silver Whisper. The cruise will visit 52 ports in 28 countries including some of the less visited coasts of Australia and Africa, as well as the iconic cities of Asia and the beaches of Bali. During 2013 Silver Spirit is set to return to the South Pacific and the isles of French Polynesia, as well as visiting Hawaii. The new expedition cruises, will again reach off the beaten track destinations. Visiting the Polar circle or the penguin colonies of the world, have to remain among the highlights of cruising onboard Silver Explorer. The exploration-style ship will also visit Central America, Patagonia and new ports of call, such as Canada's Hudson Bay. As ever, Silversea will be offering a selection of special offers on these sailings including free flights — in some cases business class — and complimentary spending money of up to $1000 per suite. With luxury cruising onboard elegant, intimate ships and offering world class cuisine and service, Silversea's most popular sailings will no doubt be selling quickly.